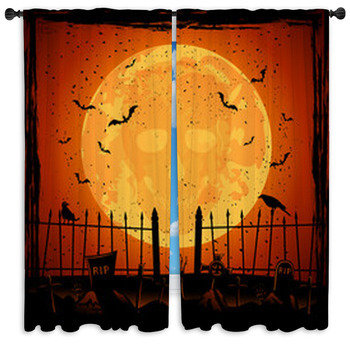 This year, don't forget to give your entire home the creepy charm of your favorite autumn holiday with our Halloween window curtains bursting with haunting Hollows Eve fun. 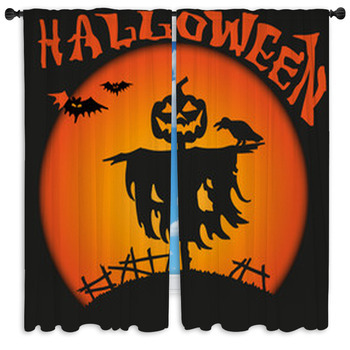 Impress your neighbors and trick-or-treaters with your awesomely terrifying decor with our custom size curtains. 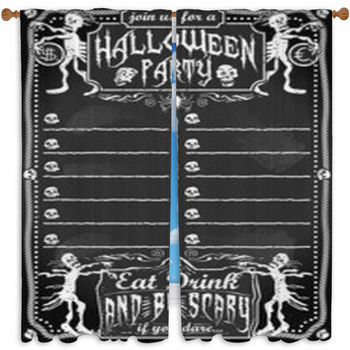 Nothing is as fun as getting dressed up and prowling the streets surrounded by ghouls, goblins and ghosts. 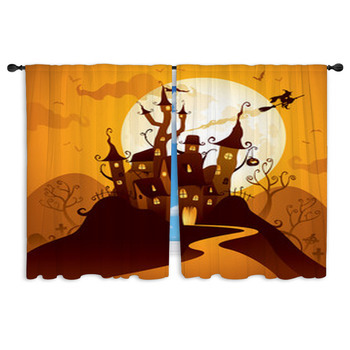 Our window curtains will give your home the perfect look of a haunted house on this special night. 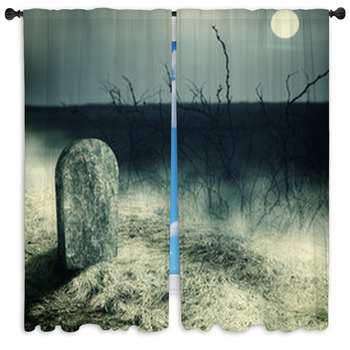 If you truly love Halloween style, leave your decorations up all year long and indulge in your passion for all things creepy that go bump in the night. 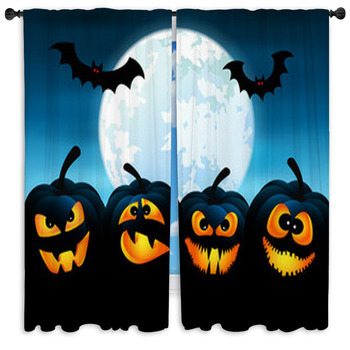 All your favorite Halloween symbols can be found as dazzling illustrations and petrifying computer generated artwork on our drapes and window valences. 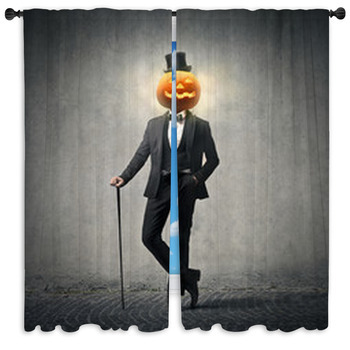 The unmistakable orange Halloween pumpkin gives a menacing smile before leafless trees that curl and twist in the dark night. 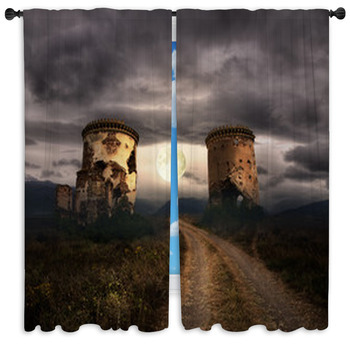 A bloodcurdling skeleton extends his bleached-bone arm, inviting you to step through a vaulted castle door that leads to a mysterious and unknown passageway. 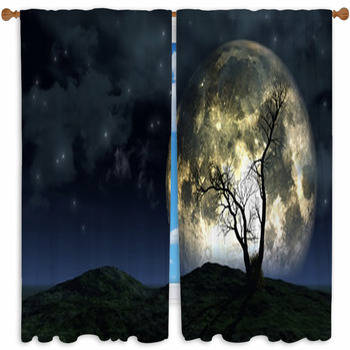 The silhouette of a moonlit graveyard is flanked by fluttering vampire bats and glowing jack-o-lanterns as a single zombie hand pushes itself up from the wet soil underneath the full silvery moon. 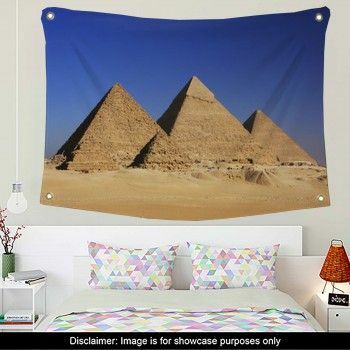 Don't be alarmed if some of these fantastically chilling images leave you shivering with fright. 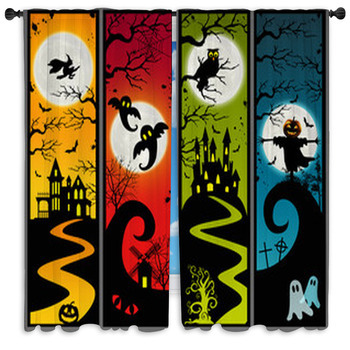 Aside from being the perfect additions to your Halloween decor theme this holiday, you can use these drapes and window valences to give your home a bit of unique style all year long. 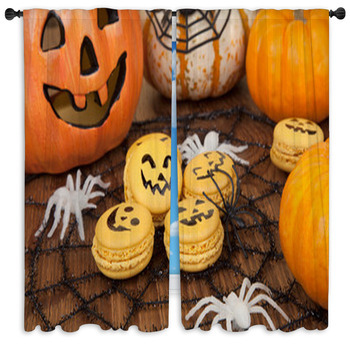 If you're a fan of horror movies or Goth culture, match them with our complementing Halloween bedding, pillows and wall murals to have a ghoulish paradise in your bedroom or living room every day of the year. 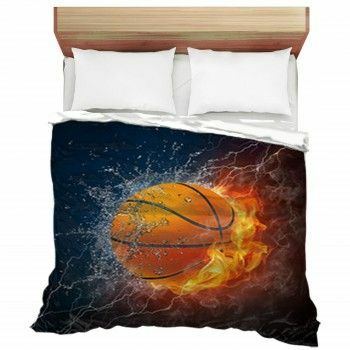 They can all be completely customized with your own personalized text exclaiming your favorite terrifying movie quote or line from one of Edgar Allen Poes petrifying books. 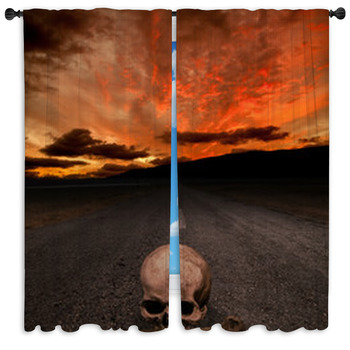 Teenagers and young children are sure to love these hair-raising and spine-chilling decor items but don't be surprised if they start checking underneath their beds.